Sri Lanka is a country where a mixed legal system applies. Muslim Law is one of the special laws which is applicable to inhabitants of Sri Lanka who are Muslims. It is one of the customary laws like Tesawalamai and Kandyan Law which are applicable to particular ethnic groups. It is important to note that Muslim Law is different from Sharia Law or Islamic Law, but the Muslim law contains certain aspects of Islamic Law or Shara Law in it. Today the private matters of Muslims are governed by Muslim Law for instance marriage, divorce custody and maintenance. Now a days, the Muslim law principles have been included into three key statutes as Act No. 13 of 1951 Marriage and Divorce (Muslim) Act, Act No. 10 of 1931 Muslim Intestate Succession Ordinance and Act No. 51 of 1956 Muslim Mosques and Charitable Trusts or Wakfs Act. As stated earlier the Muslim Law could be applied for people who are only Muslims by virtue of birth and conversion to Islam. Muslim Marriage and Divorce Act specifically says in Section 17, that every marriage contracted between Muslims after the commencement of this Act shall be registered immediately upon the conclusion of the ‘Nikah’ ceremony connected therewith. It is noteworthy to state on ‘Nikah’ . Nikah is an Arabic word and the nikah ceremony is similar to customary marriage. Section 08 of this Act states that there are male registrars to be appointed for the purpose of solemnization of Muslim marriages. Muslim Law speaks about ‘Mahr’ and ‘Kaikuli'. In which the Kaikuli is not promoted by Sharia Law. There is a special court system known as Quazi Court set up to look into the matrimonial matters and maintenance disputes of muslims. Appeals from Quazi Court shall be lodged in Board of Quazis. Muslim Law permits more than one marriage only for the male party, but it doesn't permits to misuse it's principles. It's amply clear in the case of Natalie Abeysundere Vs Christopher Abeysundere and another 1998 1 SLR 185. In this case where a non Muslim contracted his first marriage under the Marriage Registration Ordinance had contracted the second marriage under Muslim Marriage and Divorce Act during the subsistence of the marriage by embracing Islam. The court held that the second purported marriage contracted under the Muslim Marriage and Divorce Act is void notwithstanding the conversion to Islam. Commission of Sri Lanka has been the forerunner and pioneer in this composite area. In 2012, as a comprehensive extension of the service provided by the LAC in the form of 'Legal Aid', which comprises both court - based legal aid (consultation and litigation) and community - based legal aid (awareness programmes targeting public officers and general public), the LAC has planned a special programme under the theme 'Neethi Udanaya'(Legal Awakening). A series of Neethi Udanaya Programmes will cover the whole country. Preserving and respecting our cultural and historical heritage, new broad approaches that cover the new programmes will be aptly called the Ruhunu Rata Neethi Udanaya, Maya Rata Neethi Udanaya, Kandu Rata Neetrhi Udanaya, Uthuru Rata Neethi Udanaya and Raja Rata Neethi Udanaya. It is expected that, (the outcomes of) all five awakening programmes (Udanayas), which will cover the whole country in 2012/2013 and contribute to better living and lay the foundation for a better society, through legal empowerment. 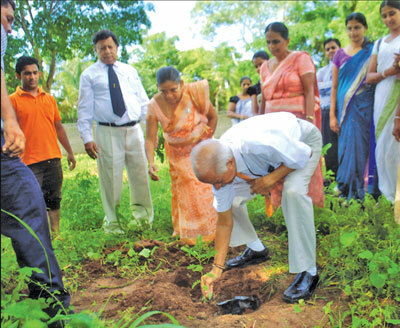 The Ruhunu Rata Neethi Udanaya will commence in February 2012 with the inauguration programme scheduled to be held in Hambantota. Question: Can a Jayabhumi / Swarnabhumi grant holder decide on ownership before his death? Answer: Yes, a holder of a permit or a Grant Certificate can decide before his death as to whom his ownership should pass. He can pass his posthumous ownership by filling a form and getting the approval of the Government Agent. Those named for posthumous ownership should be from among blood relations referred to below: wife/husband (spouse), mother, children, brothers, sisters, grand children, mothers and fathers brothers and sisters, father, children of brothers and sisters. Note 1: The owner can select one or more persons for his/her posthumous ownerships. If more than one person is selected, the land will be divided among them. Note 2: If the owner changes his/her mind after naming his or her posthumous owner/s, can name anybody else at any stage. This can be repeated any number of times. Note 3: the owner cannot name posthumous owner/s for only a portion of the land. The posthumous ownership named by the owner before marriage will automatically get revoked with the marriage. If the owner has obtained a Jayabhumi/Swarnabhumi Grant Certificate in exchange for LL Permit then too the named posthumous ownership will automatically get revoked. Question: Please let me know what kind of services can be obtained from the divisional secretaries offices to the public? Issue new vehicle license (Three Wheeler/Motor Cycles). Question: I decide to make a new passport. Please let me know who has authority to attest a passport application? 5. Grama Niladhari/Samurdhi Manager/Social Service Officer of the area. 8. Assistant Controllers, Authorized Officers and Enforcement Officers of the Department of immigration and Emigration. Question: I contributed to the W&OP pension scheme . I am unmarried and would like to know whether I can get the contributions made to the W&OP pension scheme. Answer : According to the Pension Minutes and Circulars you are entitled to get the W& OP payment . If you are unmarried at the time of getting the pension then you can obtain the W& OP payment with interest. Question: What kind of services can be obtained from the Legal aid Commission in the case of an Elders' maintenance? Answer : Under the Protection of Elders Act No.9 of 2000 you can get protection. Under the said Act you can file a case against the children to get maintenance from them through the Maintenance Board. The Maintenance Board will inform the children to pay maintenance to the parents. If they are not willing to pay maintenance, the Magistrate's Court can enforce the order. The Legal Aid Commission has set up an Elders Desk which handles cases of this nature. Further under the Domestic violence Act No34 of 2005 you can seek a protection order against them. If you need any advice, you can visit our Head Office situated at No. 129, Hulftsdorp Street, High Court Complex, Colombo 12. Question: My friend met with an accident while on employment and as a result He lost his right leg. This accident occurred in November last year. The company promised to pay him but up to date they have not done so. Is he entitled to compensation? Answer: Under the Workmens Compensation Ordinance if an employee meet with an accident while in service and as a result of his employment, then he is entitled to compensation computed on the basis of the seriousness of the injury. Such compensation has to be obtained by forwarding an application to the commissioner on compensation and application has to be forwarded within two years of the accident. You have to forward this application with a medical certificate obtained from a qualified practitioner. The address. The Commissioner , No 136, Vauxhall Street, Colombo 02. Question: Who may apply for a death certificate of a person missing due to terrorist activity ,which has taken place within Sri Lanka? Answer: A next of kin of such person can apply for a death certificate. According to the section 2 of the Registration of Death (Tempaporary Provisions) Act, No 19 of 2010 state as follows. 2. (1) Where any person is reported missing and he has not been heard of for a period exceeding one year by those who would naturally have heard of him, had he been alive and his disappearance is attributable to any terrorist orsubversive activity or civil commotion which has taken place within Sri Lanka, a next of kin of such person if he verily believes such person to be dead, may apply in the manner hereinafter provided, to register the death of such person under the provisions of the Births and Deaths Registration Act and to have issued to him, a Certificate of Death in respect of such person. (2) Every application under this section shall be substantially in the Form specified in the Schedule to this Act and shall be forwarded to the Registrar-General or theDistrict Registrar of Births and Deaths of the District in which such missing person was last resident or had his permanent residence. ...................................................................... do hereby state that the said................................................................... (name of the person missing).......................................................................... has been missing for a period of over one year, and I verily believe that the said.............................................................. is dead. I therefore request that the death be registered under the Births and Deaths Registration Act (Chapter 110) and a Certificate of Death in respect of such death be issued to me. Question: I decided to start a Vocational Traning Centre. Is it necesssary to obtain prior approval from any department or commission? Answer: Yes. You have to obtain prior approval from the Tertiary and Vocational Education Commission. The Tertiary and Vocational Education Commission, popularly known as TVEC was established in 1991 under the Tertiary and Vocational Education Act No. 20 of 1990 and reconstituted as a statutory body by the TVE (Amendment) Act. No 50 of 1999. The Commission is the apex body in the Technical and Vocational Education and Training (TVET) sector. Its primary responsibility is policy formulation, planning, quality assurance, coordination and development of tertiary and vocational education in the country. Question: I am employed in a company in Colombo which has 400 employees. The company decided to close down the division where I am working effective from 30.10.2011. My period of service in the company is 30 years. The company has given me notice of termination of employment from 30.10.2011. What do I do? Answer: You can complain to the Commissiorner of the Labour Termination Unit within six months from 30.10.2011 and obtain relief. You can also file a case in the Labour Tribunal within six months from 30.10.2011 and obtain relief. You cannot obtain relief from the Labour Tribunal as well as Commissioner of Labour. You will have to decide where to go. Question: Many clients come to the legal aid centres to register unregistered births. Please explain how it is done? Answer: One of the parents or an interested party should forward a declaration containing all particulars relating to the birth to the Divisional Secretariat to which the place of birth belongs. Following documents should be produced with the declaration. a. A certificate obtained from the Divisional Secretariat to the effect that the birth has not been registered. B A list of brothers /sisters of whose birth has not been registered. c. Certificate of Marriage of the parents, if they are married. a. Hospital birth report or a certified copy of it. b. Grama Niladhari's report or a certified copy of it. c. Estate birth report or a certified copy of it. d. A copy of the midwife's register of births. In the absence of the documents stated in above (1), one of the following documents may be acceptable. a. Horoscope or the record of the time of the birth which has been prepared on a proximate date after the date, on which the birth occurred. d.A certified copy of the admission register of the subject's admission to the school for the first time. If none of these documents could be forwarded, a declaration containing birth particulars and an affidavit from the declarant as per the specimen in annexe 01 hereof should be produced. Question: I am a Sri Lankan citizen and have decided to marry a partner who is a Dutch citizen. We want to get married in Sri Lanka. Could you please let me know what documents my partner needs in order to marry me in Sri Lanka? Answer: Marriage can be registered after four days of arrival to Sri Lanka. Please contact the Additional District Registrar in the relevant Divisional Secretariat Office or the Marriage Registrar within the area you are temporary residing in Sri Lanka. Your fiance may bring the following documents. Question: I am a Sri Lankan and my husband is a Bangladeshi citizen. We married in Saudi Arabia. How can we register our marriage in Sri Lanka? Answer: If your marriage has been registered in the Embassy of Sri lanka in Saudi Arabia,it is same as your marriage is registered in Sri Lanka. The Embassy in your country will sends a copy of your marriage certificate to Sri Lanka to be stored in the Central Record Room. Send an application to the Central Record Room in Colombo to obtain certified copies of your marriage certificate.